Do you lead a busy lifestyle, find it difficult to sit down and have a good breakfast in the morning? I have the same problem on cold winter’s mornings only because I like my bed so much and find it difficult to get out I’d rather stay in bed for a bit longer…. than having breakfast. I know it’s bad, but I still do it. I guess there are many people like me who skip their breakfast and for that reason I would like to share with your one of my recipe for “breakfast on the run”. Oatmeal, Granola, Honey & Peanut Butter Booster Breakfast Bars are a healthy, wholesome and absolutely delicious little snack! Every day I pack myself “morning snack” for work. I’m so miserably by 10am especially if I haven’t had breakfast and I get very hungry. 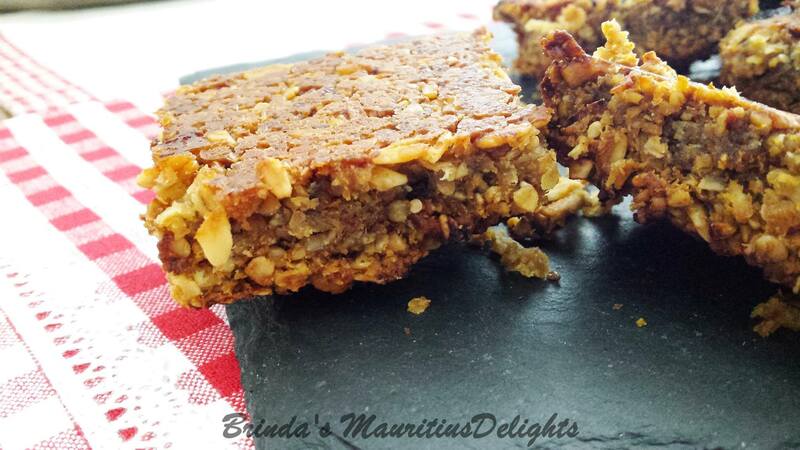 My Oatmeal & Granola Breakfast Bars combines some of my favourite such as peanut butter, mixed seeds, coconut, pineapple and honey. 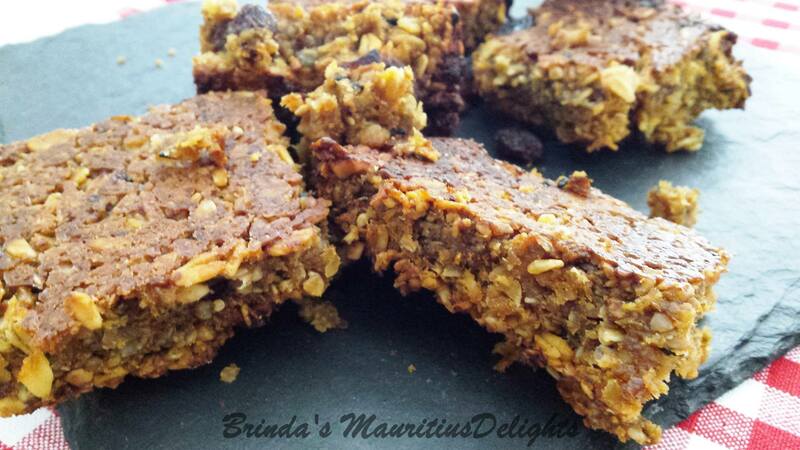 With a blend of all the ingredients these yummy bars will keep you powered for hours. In addition I have my golden and dark Muscovado sugar, for that extra molasses taste. These oatmeal Granola breakfast bars are easy, simply stir together the dry and wet ingredients, pour into a tray, and bake. You can whip up a batch on Sunday night & have breakfast on the run sorted for the rest of the week. 1. Grease and line a baking tin, about 20cm square. 2. Put the butter, sugar, peanut butter, honey and grated citrus zests in a deep saucepan over a very low heat. Leave until melted, stirring from time to time. 3. Stir the oats, dried fruit and three-quarters of the seeds into the melted butter mixture until thoroughly combined. Spread the mixture out evenly in the baking tin, smoothing the top as you go. 4. Scatter the remaining seeds over the surface and trickle with a little more honey. Place in preheated oven 160°C/Gas Mark 3 and bake for about 30 minutes, until golden in the centre and golden brown at the edges. 5. Leave to cool completely in the tin (be patient – it cuts much better when cold), then turn out and cut into squares with a sharp knife. These bars will keep for 5-7 days in an airtight tin. Brinda’s Note: You can replace the peanut butter with 1 medium ripe banana (about 175g), mashed. Stir it in after all the other ingredients have been combined. I hope you enjoy making them and eating them!